At Zimmer and Peacock we carry our contract development and manufacturing of electrodes, sensors and biosensors. 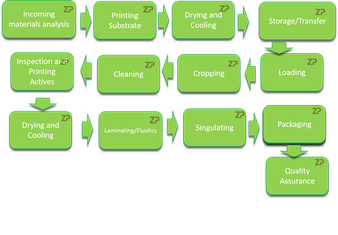 ZP is different in that we understand and can perform the entire workflow from: printing to functionalizing, to addition of microfluidics to final calibration of batches. In this article we expand upon this and describe some ways of getting to market quicker. The issue with any custom manufacturing is that great manufacturing accuracy and precision comes with manufacturing volume, and in the same way low cost and high yield also comes with manufacturing volume. What we mean by this is 'the more you make something, the better you are at it'. If we take the example of custom screen printed electrodes we receive a lot of requests for custom screen printed electrodes, but when we look at the designs you discover that they are all fairly similar. At ZP we have both standard electrodes and we also provide custom manufacturing services. The benefit of using a ZP standard product, particular our value electrode range, is that they are already a high volume manufacture piece has gone through the wafer mapping process. The advantage to our customers, clients and collaborators is that they can purchase just two electrodes to try out, or thousands of electrodes which have already been functionally tested. Zimmer and Peacock is unusual in that we can both manufacture electrodes but we can also functionalize the electrodes to make them specific; the materials we are used to handling include: aptamers, ionophores, enzymes, DNA antibodies, antigens etc. Zimmer and Peacock has a number or pre-existing sensors and biosensors which can accelerate the time to get to market. At Zimmer and Peacock we are often asked to do custom/contract manufacturing of screen printed electrodes. At Zimmer and Peacock we take a more holistic approach to the screen printing of electrodes for sensor and biosensor applications. Electrodes on the R and D market are often shipped functionally untested, what this means is that the electrodes are visually inspected but appearance is not a god assessment on how an electrode will function as a biosensor. ZP is different in that we are able to electrochemically functionally test electrodes and sensors before shipping; at ZP we call this process wafer mapping. ZP can also functionally test electrodes/sensors and so assign calibration factors to the electrodes/sensors so that the performance of the sensor in the hands of the final user is the most precise and accurate it can be. the calibration factors can be transmitted using technologies such as RFID or QR codes. Self filling/capillary filling is a feature common on glucose electrochemical sensors/strips; at ZP are able to provide this technology either as a custom part or as a standard product; again the use of the standard product reduces tiem and the cost to our collaborators. If you have any questions regarding ZP please don't hesitate to contact us.